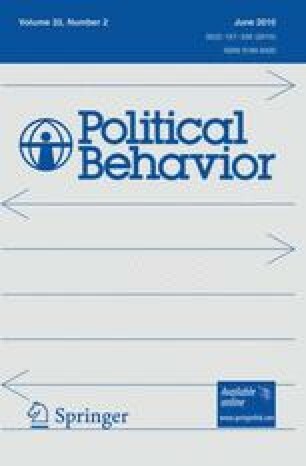 A previous version of this paper was presented at the 2006 annual meeting of the American Political Science Association. We thank anonymous reviewers, the editors, and audiences at the University of North Carolina at Chapel Hill, Northwestern University, and the Duke Political Science Graduate Student Colloquium for valuable feedback. Wilkes-Barre, PA, October 7, 2004 (AP)—President Bush delivered a hard-hitting speech here today that made his strategy for the remainder of the campaign crystal clear: a rousing, no-retreat defense of the Iraq war. Bush maintained Wednesday that the war in Iraq was the right thing to do and that Iraq stood out as a place where terrorists might get weapons of mass destruction. “There was a risk, a real risk, that Saddam Hussein would pass weapons or materials or information to terrorist networks, and in the world after September the 11th, that was a risk we could not afford to take,” Bush said. While Bush was making campaign stops in Pennsylvania, the Central Intelligence Agency released a report that concludes that Saddam Hussein did not possess stockpiles of illicit weapons at the time of the U.S. invasion in March 2003, nor was any program to produce them under way at the time. The report, authored by Charles Duelfer, who advises the director of central intelligence on Iraqi weapons, says Saddam made a decision sometime in the 1990s to destroy known stockpiles of chemical weapons. Duelfer also said that inspectors destroyed the nuclear program sometime after 1991. The President travels to Ohio tomorrow for more campaign stops. Immediately before the U.S. invasion, Iraq had an active weapons of mass destruction program, the ability to produce these weapons, and large stockpiles of WMD, but Saddam Hussein was able to hide or destroy these weapons right before U.S. forces arrived. During a speech in Washington, DC on Wednesday, President Bush maintained that the war in Iraq was the right thing to do and that Iraq stood out as a place where terrorists might get weapons of mass destruction. In 2004, the Central Intelligence Agency released a report that concludes that Saddam Hussein did not possess stockpiles of illicit weapons at the time of the U.S. invasion in March 2003, nor was any program to produce them under way at the time. The President travels to Ohio tomorrow to give another speech about Iraq. Immediately before the U.S. invasion, Iraq had an active weapons of mass destruction program and large stockpiles of WMD. President George W. Bush urged Congress to make permanent the tax cuts enacted during his first term and draft legislation to bolster the Social Security program, after the lawmakers return from their August break. The expanding economy is helping reduce the amount of money the U.S. government plans to borrow from July through September, the Treasury Department said on Wednesday. The government will borrow a net $59 billion in the current quarter, $44 billion less than it originally predicted, as a surge in tax revenue cut the forecast for the federal budget deficit. The White House’s Office of Management and Budget last month forecast a $333 billion budget gap for the fiscal year that ends Sept. 30, down from a record $412 billion last year. However, even with the recent increases, revenues in 2005 will remain well below previous projections from the Congressional Budget Office. The major tax cut of 2001 and further cuts in each of the last three years were followed by an unprecedented three-year decline in nominal tax revenues, from $2 trillion in 2000 to $1.8 trillion in 2003. Last year, revenues rebounded slightly to $1.9 trillion. But at 16.3 percent of the gross domestic product, last year’s revenue total, measured against the size of the economy, was the lowest level since 1959. President Bush’s tax cuts have increased government revenue. Sen. John Edwards (D-N.C.) yesterday slammed President Bush and promised that a Kerry administration would support the promising young field of embryonic stem cell research. The vice presidential contender’s comments came on the third anniversary of President Bush’s televised address to the nation announcing a funding policy for the controversial research, which relies on human embryos as a source of cells. The much-debated but still experimental field of study has become an unanticipated wedge issue in this fall’s election. Edwards’s running mate on the Democratic ticket, Sen. John F. Kerry (Mass. ), mentioned the topic in a number of speeches last week. Kerry also devoted a large chunk of the Democrats’ weekly radio address Saturday to it, saying that science should not be sacrificed for ideology. However, experts pointed out that Bush’s action does not limit private funding of stem cell research. He is actually the first president to allow the use of federal funds to study human embryonic stem cells, but his policy limits federal support of such research to colonies derived from embryos already destroyed by August 2001. President Bush has banned stem cell research in the United States. Pew Research Center for the People & the Press (2005). Public more critical of press, but goodwill persists: Online newspaper readership countering print losses. Poll conducted June 8–12, 2005 and released June 26, 2005. Downloaded December 6, 2008 from http://people-press.org/reports/pdf/248.pdf. Program on International Policy Attitudes (2004). PIPA-knowledge networks poll: Separate realities of Bush and Kerry supporters. Downloaded December 30, 2009 from http://www.pipa.org/OnlineReports/Iraq/IraqRealities_Oct04/IraqRealities%20Oct04%20quaire.pdf. Program on International Policy Attitudes (2006). Americans on Iraq: Three years on. Downloaded December 30, 2009 from http://www.worldpublicopinion.org/pipa/pdf/mar06/USIraq_Mar06-quaire.pdf. Robertson, L. (2007). “Supply-side Spin.” Factcheck.org. June 11, 2007. Downloaded December 6, 2008 from http://www.factcheck.org/taxes/supply-side_spin.html.